Posted on March 3, 2014 - Get free updates of new posts here. A few years ago most SEO strategies involved a trial and error approach where you built a huge volume of links with some of them working and some of them not. The overall result was that you could rank your sites relatively easy when you had enough links that Google deemed ‘high quality’. Recent algorithm changes by Google such as Google Penguin have targeted low quality links and penalised sites if they had low quality links pointing at them. This has meant that any sites that have engaged in SEO in the past and either built low quality links themselves or had agencies building it for them have lost their rankings or been penalised. Because of these updates a lot of work is being done on link profiles and the analysis of backlinks built in the past. To assess the low quality links in your own backlink profile to determine which ones to get removed or which one to disavow with Google. To determine which links your competitors have that are helping them rank for certain keywords to obtain them yourself. To check your backlink profiles are similar to your competitors with no suspicious differences in a range of metrics (ie. anchor text diversity). Commonly people use either the ‘links:duncanjonesnz.com’ search qualifier in Google to see backlinks or they use Google Webmaster Tools which gives a list of links to the target website, however these backlink analysis tools are very limited and by Google’s own admission only give a select sample of the total backlinks a site may have. Luckily a number of extremely useful third party backlink tools have been created which crawl the web like Google gathering backlinks and other data and then allowing you to analyse this data through their easy to use online platforms. Following is the backlink analysis tools I think are the best and should be an essential part of your SEO strategy. Using Google searches to find your backlinks is free and easy to do but not as detailed as third party tools. Quick Analysis – fast loading analysis of a sites backlinks or a comparison of up to five domains and the differences in each backlink profile. Backlink Profiling – a thorough look into your own or a competitors backlink profile with detailed information on each link’s value, trust and many other metrics. Competitive Research – compares your domain against your competitive landscape to identify strengths, weaknesses and keyword opportunities. Identifies strong healthy links from your competitors and niche wide toxic links and compares link velocity for each competitor. Link Prospecting – helps find link acquisition targets with metrics for each link, identifies common backlinks between competitors and link targets which your competitors link to so they indirectly link to your target site. Link Monitoring – Get instant alerts when new links to your site are found to keep ahead of any Negative SEO attempts and for reporting. Site Audit – this tool does a full audit on your whole backlink profile and shows you high risk toxic or suspicious links which should be investigated and removed or disavowed. LinkResearchTools starts at €99 per month so it is not cheap but it does offer an impressive package of tools not available elsewhere. They do offer a free trial which you can start here. A Link Research Tools report showing a website with suspicious differences in keyword anchor text type to its main competitors. Trust Flow – is a measure weighted by the number of clicks or distance a site is from a set number of hand picked trusted sites. 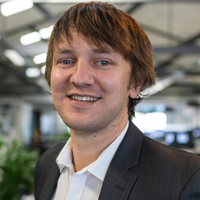 This measure is important because of the theory that trusted sites (such as nzherald.co.nz) will almost always only link to other trusted sites which can help ascertain low quality links. Citation Flow – is a measure of how influential a URL might be based on how many sites link to it with a weighting towards perceived stronger links. Majestic SEO have a range of prices available from a Free offering through to an expensive enterprise-level plan. They also have a huge range of other features so check them out here. 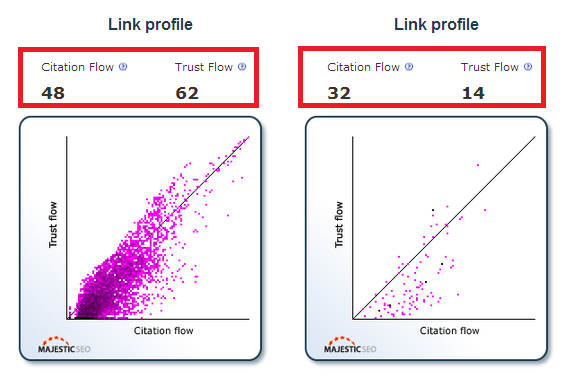 A visual comparison of two sites link profiles using the metrics Trust Flow and Citation Flow. Cognitive SEO is similar to Link Research Tools in that it combines data sources from the main backlink crawling services, they provide a number of tools which allow you to quickly and easily analyse your competitors link building strategies with the ability to see the evolution of your competitors strategies with a lot of valuable insights on each link. As part of their tool set Cognitive allows the daily monitoring of your sites keyword rankings which is the goal of link building in the first place and is a very useful addition. For large teams and agencies one of the most useful tools that Cognitive offers is Project Management functionality which allows teams working remotely or even in the same office to easily manage, measure and organise link building efforts ensuring that your SEO strategy is scalable. Cognitive SEO offer a free 14 day trial which you can sign up for here, after that you get full access to the tools for $99 per month. A CognitiveSEO report showing breakdown of links by type, useful for determining backlink issues. Ahrefs is a relative newcomer to the link analysis industry but it has made some impressive advancements in terms of the speed at which it crawls. The Ahrefs crawler can crawl up to 6 billion pages every 24 hours and they update their index every 15 minutes on average meaning the index is constantly improving and remaining fresh. Similar to Majestic SEO, Ahrefs offer its own rank metric named ‘Ahrefs Rank’ which aims at giving every URL in its index a measurement similar to Google Page Rank. This rank is based predominantly on link strength so is less useful than ‘Trust Flow’ in my opinion but can be used to quickly analyse and find high quality link targets. Ahrefs have a free trial offer which you can sign up for here with their paid plans starting from $79 a month. Open Site Explorer is an offering from Moz.com which used to be known as SEOmoz. It is similar to both MajesticSEO and Ahrefs but their index is updated every 4 weeks meaning there is some lag time to get your latest links. Moz offers a wide range of analytics tools in addition to Open Site Explorer so by subscribing to backlinks you will also get other helpful tools such as an easy to use Dashboard with your key metrics, a breakdown of search metrics such as keyword rankings, a report on your social media activity including who your brands top social influencers are as well as a dashboard where you can easily find all of your brand mentions from around the web. Moz Analytics have a 30 day trial for their bundled package which will get you access to Open Site Explorer and a lot of other useful tools – sign up for your trial here. Each tool will suit a different type of website or strategy so the best idea is to take advantage of the free trials and see which one will work best for you. These tools are not cheap and to get the best out of them you need to use them regularly and in a way which maximises both your time and your return on the investment. In future articles I will help you to better use these tools and provide strategies on how to use tools to maximise your SEO results. Click here to subscribe to my email newsletter and get notified when I release these strategies.